The most recent data on how Americans pay for college show that parents are taking on more of the debt burden for their kids. 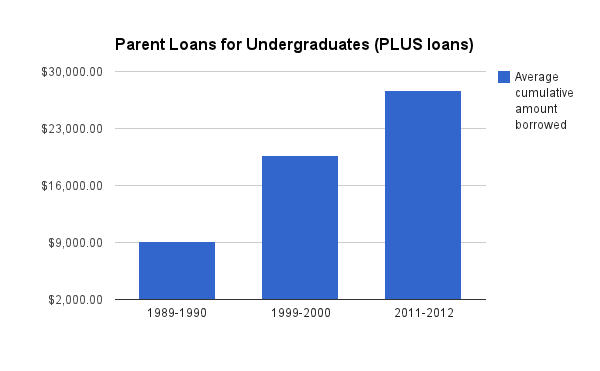 In 1999 about 13 percent of parents took out PLUS loans. The average loan amount was $19,700 in inflation-adjusted dollars. By 2011, the numbers had increased to 21 percent of parents taking out college loans for their kids, each with a debt of $27,700 in inflation-adjusted dollars. That’s a 60 percent jump in the percentage of parents taking out loans and a 40 percent jump in the loan amount. “One of the biggest changes we’re seeing is that parents are borrowing a lot more money,” said Susan Aud of the National Center for Education Statistics, speaking on May 18, 2014 about long-term trends in the National Postsecondary Student Aid Study, which tracks how students pay for college. PLUS loans (Parent Loans for UndergraduateS) are direct loans from the federal government. They don’t include all parent borrowing to pay college bills. Some parents take out home equity loans or go into credit card debt, which this data doesn’t capture. But PLUS loans are probably still a good indicator of parent financing trends because their low fixed interest rates make them very popular. Some of the increase in PLUS loans may not only be a reflection of changing parenting philosophies and rising college costs (i.e. indulgent parents who don’t want to saddle their children with crazy high college debts) but also a reflection of how much easier it is for parents to navigate the federal student loan system through a single application. The U.S. Department of Education took over the student loan system in 2010. Previously banks and other private sector lenders issued government-guaranteed loans.